South Africa fought back from a difficult start to seal a two-nil victory in the Twenty20 series against West Indies on another scrappy pitch at the Sir Vivian Richards Stadium in Antigua. After the wretched encounter in the first game, this tense finish was a welcome change. The pitch wasn't conducive to the boundary-soaked Twenty20 cricket crowds routinely expect but it provided a low-scoring last-ball finish as South Africa edged home. Once again there were only a smattering of spectators, with the powers that be opting to appease TV schedules around the world and stage the match in the early afternoon, rather than under lights in the evening. Those that did turn up would have been disappointed that the home-side's batsmen couldn't follow up a disciplined bowling effort that restricted South Africa to 120, a modest total despite the pitch. With West Indies needing 15 from a dramatic last over, Darren Sammy managed to top-edge the second ball for four and then, extraordinarily, took advantage of loose fielding to collect an all-run four when a single looked sketchy. It left five needed from three deliveries but Ryan McLaren held his nerve to leave West Indies a run short. It should never have reached that stage but West Indies are so reliant on Chris Gayle that his dismissal to a fired-up Dale Seyn in the first over set a negative tone from which they could never quite emerge. 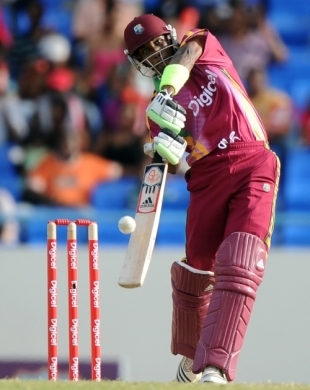 Andre Fletcher fell soon after for his ninth single-digit score in 14 matches and Dwayne Bravo and Shivnarine Chanderpaul started very cautiously. Bravo, so often a picture of exuberance, was rendered shotless by some disciplined bowling early on from Morne Morkel and Lonwabo Tsotsobe, who came in for Charl Langeveldt and Roelof van der Merwe. Time and again Bravo picked the infielders and had eight from his first 20 balls. By the half-way stage of the innings Chanderpaul and Bravo had put on 24 from 43 painstaking deliveries and West Indies had a solitary boundary in the innings. McLaren, whose 5 for 19 earned him man of the match in the last game, had to wait until the seventh over for his first ball. Like all the quicks he was encouraged by the pitch immediately as a half-tracker trampolined past Bravo's face to a leaping de Villiers. By that stage the game looked to be drifting away but Chanderpaul began to pick up the singles and Bravo the odd boundary. Though they were choked by Johan Botha's impressive offspin, 15 was taken from Tsotsobe in the 14th over to ease the equation to 52 off the last six overs. It proved too much as South Africa fought back immediately. Chanderpaul followed up a well-timed pull for six with a series of failed reverse-sweeps and ended up top-edging a catch behind still looking for the shot. When Bravo then fell two overs later the target looked out of reach. West Indies could have been chasing an even easier total had 20-year-old debutant David Miller not helped his side recover from 59 for 5 in a bright 57-run partnership with Botha. He batted with power and a conviction missing from all the other batsmen on this surface to lift the score to a match-winning total. Miller was only included because of a slight groin injury to Jacques Kallis, but South Africa will be cheered by what they saw of the youngster as they try to rebuild their side after the World Twenty20 disappointment.